I “played “ with energy beams around me. Not having any idea what it was, I approached it with an open heart, with no clue as to where it would lead. My Dad, John Anthony D’Erasmo led me to Edgar Cayce books at sixteen which prompted me to read more about Healing, a topic I never tire of, and seemed drawn to, even at that young age. In 1998 my Dad was having open heart surgery in Sarasota, Florida. Concerned about his condition, I lovingly held my hands over him, moving them along his torso, with the healing color of green in mind. His vitals, which had been erratic, became stabilized and his breathing became easy and rhythmic. “I am sending loving energy to Dad, “ was my reply. Well, that has become my mantra and my inspiration as I was led to Inspiration Point, a Buffalo-based book store with material on enlightenment and healing. There, I learned about the variety of choices for training in the energetic healing field. 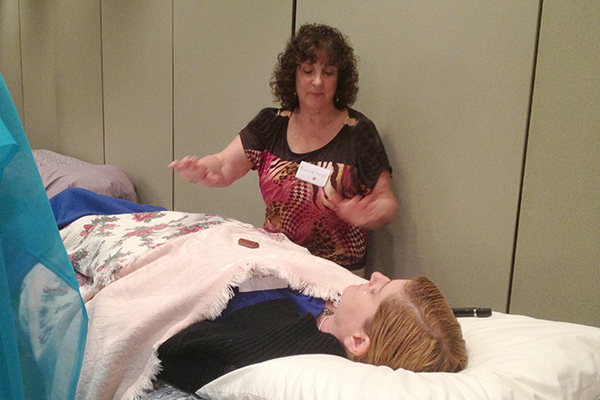 There is Therapeutic Touch, Reiki, Healing Touch, Quantum Healing, EFT, and Lomilomi, among others. So, my training began. By 2002, I was certified as a Healing Touch Practitioner, a program designed with nurses in mind, but open to those who were interested in a love-centered intentional energy healing program. I chose Healing Touch because of its tough requirements for certification. Nurses may take the courses for continuing education credit and it is endorsed by the American Holistic Nurses Association (AHNA), endorsed and approved by the National Certification Board for Therapeutic Massage and Body Work (NCBTMB) and the NCCA: National Commission for Certifying Agencies. Being an educator, I respect a program with stringent guidelines and consistency of instruction with a Certification Board. . I also became certified as a Reiki Master (Japanese energetic healing), Lomilomi (Hawaiian healing) and Therapeutic Touch, developed by Dolores Krieger, a leader in the energetic field. I read continuously about the energetic field and have my own practice. I am so excited to share this work with the world. I am author of three books for those new to energy healing and parents/teachers and children which provide information about the human energy system. Retired from education in 2010, I now devote my time to seminars, healings and writing.